There was a time, not that long ago, when the ONLY phone you could have in the corporate world was a BlackBerry. In the world of corporate banking, using an iPhone for work pretty much meant that you were an anarchist (although many of them had one for personal use). The perception was that BlackBerry was secure, where other phones were not. However, that perception has been slowly changing. In spite of some malware warnings (usually from security software providers) there are many tens of millions of Android and iPhones out there with little evidence of security issues. According to a new study, BlackBerry’s recent outage will considerably damage the company, with many of their users switching to other smartphones. YouGov’s smartphone survey (SMIX) found that in September most BlackBerry users rated the company between 8 & 10 (out of 10) for satisfaction. However, following last week’s problems, the overall satisfaction dropped by a massive 8 points. This was particularly marked by the number of users who would consider buying a BlackBerry again. Just 42% of users said they would get another BlackBerry, a drop of 11% on the previous study. Another recent study by Enterprise Management Associates (EMA) found that only 16 percent were “completely satisfied” with their BlackBerries, compared to 44 percent of iPhone users. Of course, conducting a study immediately after such a major outage will reveal customers at their least dissatisfied. RIM still retain a high level of customer loyalty and currently there is nothing that directly challenges BBM for both cost, ease of use and security. Now, if Apple were to develop a secure messaging function then maybe BlackBerry’s future then maybe the corporate world will switch to the iPhone. This message is illegal for two reasons: firstly no one has opted in to receive it, and secondly the company is not identified in the message. If a recipient replies to a message with YES or CLAIM they will receive a call to make it into a qualified lead which will be sold on. The call is always from a withheld number (also illegal) and the company will tell you that their name is something like ‘PPI Compensations Team’ or ‘Affiliate Data Systems’ and that information was passed on from their ‘Network Affiliate Response Team’. If you ask for any more information about the company, such as their address or website, then they will simply terminate the call. The companies have also started to ask if the enquiry was as the result of completing an online survey and that no unsolicited message was received in order to generate the lead. Of course, as the spammers and the company calling are one and the same, they know that the lead was a result of their unsolicited message. However, if someone believes that they really will bet £2900 then they are likely to agree that they did indeed complete an online survey. By creating this collusion with the claimant it confirms to the company that they will not report them for an unsolicited text when they reveal their identity much further down the line. However the fact remains they are operating illegally in both the SMS and by refusing to reveal the company’s identity during the call. The advice for dealing with these messages and calls remains the same as the accident claims ones. 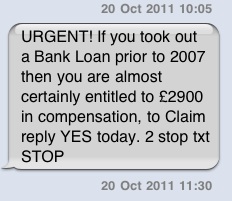 Best advice is to ignore it and report it to your operator (forward the message to 7726, or 67726 on Vodafone). If you have any further information about the company then report it to the Information Commissioner. Exactly the same operational methods are being used for the loans that have been used for the accident claims texts. The company, Affiliate Data Systems have been doing the rounds for some time. If you want to have fun with it, then you can reply YES and make up a claim (as long as you don’t actually attempt to claim) and waste as much of their time as you can. SMS Spam: what does India tell us about stopping it? It was little over a month ago when the Indian regulator, TRAI took steps to stem the flood of spam in the country. A number of measures were introduced, including larger fines, registration of messaging companies, and limiting the daily text messages on pre-pay SIMs to 100 per day. It was the latter move that grabbed the worldwide headlines because it was something that significantly affected many consumers. And surprise surprise, it seems to have made little difference. Although a dip was reported shortly after the measure was introduced, feedback from consumers shows that in just a few weeks, the spam levels have gone back up. All the spammers did was to switch their operating method to using web-based messaging systems. There are even reports of a switch to voice-calling. Although the two markets are different in some respects, this is very telling for the work being done in the UK to reduce SMS spam. No one has yet suggested restricting text messages, however some people have called for ID to be used when buying PAYG SIMs. However, the government is planning to remove paid leads in the personal injuries market. This may or may not reduce the spam in this area, but the evidence is that they will simply move on to something else: PPI claims or debt management. As long as there is money to be made, spammers will try. Does this mean there’s no solution to spam? There is one, but it will come from a combination of better filtering and management by the operators, better enforcement of the existing regulations and consumer education to ignore and report unsolicited messages. As something of a Facebook skeptic (at least when it comes to a personal account), this handy inforgraphic lays out the history of problems with the social network. Interestingly, it was the failure of others, such as Friendster and MySpace that paved the way for Facebook’s success. So in spite of getting it wrong on a regular basis, the rise and rise of Facebook continues. Never mind the privacy, its the functionality that counts. BlackBerry has announced that its new OS7 will include the facility to share files, contacts, docs and more between handsets, which are NFC enabled. RIM has been adding NFC chips to it’s higher end Curve and Bold models since the spring this year. They are not the only company to show an interest in Contactless technologies in mobile. Orange, in conjunction with Barclay card launched a Samsung NFC phone in 2011. Google has also firmly shown their commitment to NFC with their wallet. However, BlackBerry is the first to promote the file sharing aspect of the technology. Outside of the business market, their key demographic are younger users (it’s all about BBM), and the presence of P2P-based file sharing will set well with that audience. It was this demographic that made use of Bluetooth for file sharing in the days when Nokia were still making phones. BlackBerry Tag looks set to replace that for their users. VFC has been slow to roll out, but could BlackBerry tag do for contactless what BBM did for IM on mobile? Although not primarily aimed at mobile marketing, this initiative could help open things up for that market. The company will include a developer API to allow third party integration with the ‘tap to share’ function. Look out for a ‘tap’ to do download poster in the near future.